Red Head Bride Pride | Get Me To the Chapel! While looking through some bridal magazines and looking around online, I noticed something…. There are rarely ever any red-haired brides featured, or red haired models used in shoots for gowns. Being a red-head myself, I found this a bit discouraging. Do magazine editors feel like red-head models won’t “fit the mold” for modeling these dresses or something!? 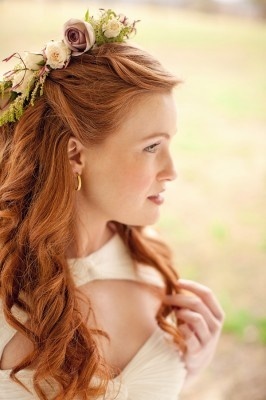 So, I set out to find some pictures of some red-haired brides, just for a little inspiration. 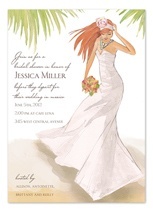 Bridal shower invitation featuring a red-head bride, from invitationconsultants.com.